Run by mum of one (soon to be two!) Sophie, based in the East Riding. 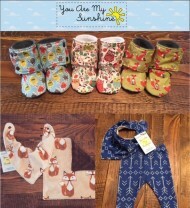 You Are My Sunshine sells unique handmade clothes and accessories for babies and toddlers. Items are custom made in a wide range of styles and fabrics to the customers specification. or follow her on facebook here or check out her Etsy shop here.